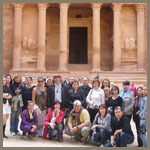 Individual work with each client, development of a trip that meets the requirements and preferences of each tourist - all these are the basics in organizing a successful tour to Jordan. To reach this goal, the tour-company employee should have a good knowledge in the specific features of the country and its resorts, and here comes the main aim of organizing FAM trips. Although our trips main focus is reviewing the hotels, and studying the peculiarities of the tourism infrastructure of the country, we try after all to make our tours interesting and enjoyable, and also to draw your attention to the wonderful country of Jordan. As a result, FAM trip reports ensure our neat organization for it. A trip with a group of like-minded persons, colleagues or simply compatriots is not only interesting, but also beneficial in the economical side, beside that; these trips emphasize the team work in the companies. All these benefits were demonstrated by setting up mass tours and incentive programs. In our website we present some photos of our combined tours, corporate trips and programs, these photos submit that the mass tours are a bright and interesting experience to have.